Over 800 miles away, students in Chicago start their day the same way, and have been doing so for almost 10 years. In 2008, Stacy Tessler Lindau was presented with a challenge. 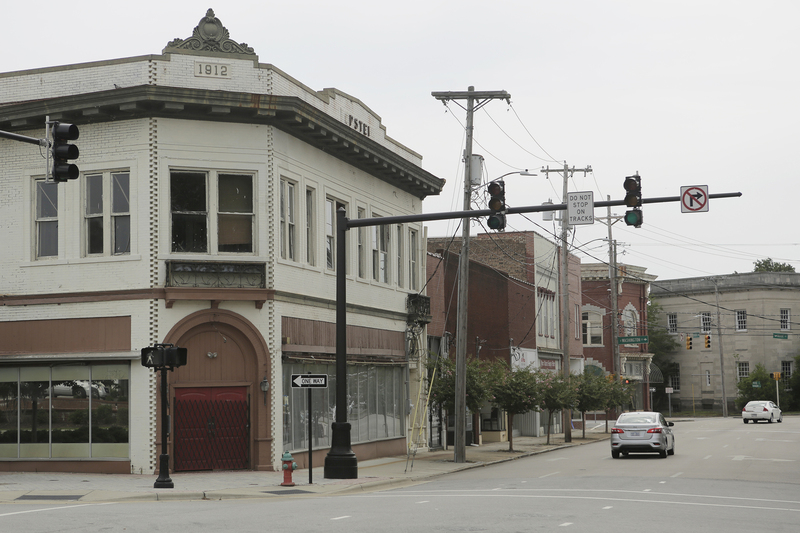 As part of the South Side Health & Vitality Studies (SSHVS) at the University of Chicago Health Initiative, Lindau was on a team working with leaders and residents of the city’s south side to improve health and economic strength in the area. 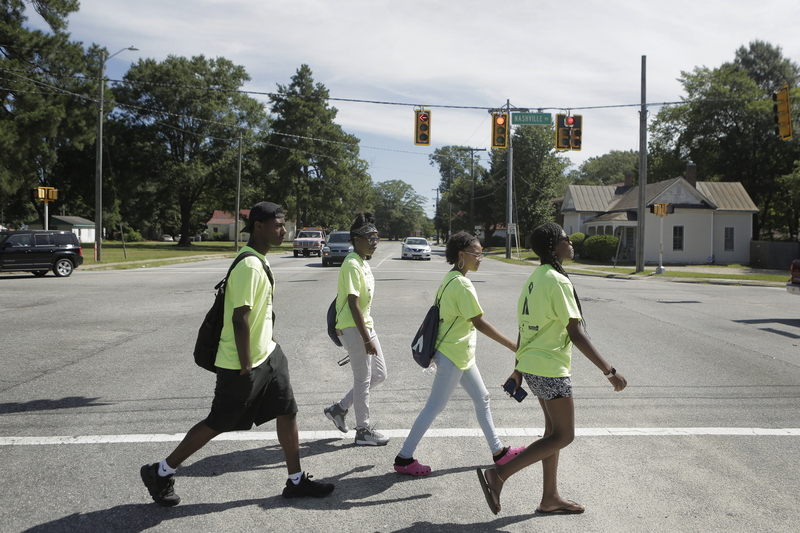 The group had three goals: involve local teens, adopt a broad definition of health to include factors like economic status, and produce data that the public can use. Students began mapping businesses in central Rocky Mount, and have since expanded past the city borders into Nash and Edgecombe counties. Community input steered SSHVS toward examining how to help businesses succeed in the region. By studying commercial data sets and public information like tax records and nonprofit registries, they quickly realized low-income communities were relatively invisible to mainstream online sources. Results showed a 30 to 40 percent error rate – the percentage of businesses that were open but not represented online. Another 30 percent were closed but appeared to be open according to online sources. Not being able to find a business by a simple internet search may seem like a small problem, but Lindau says it can have big consequences. MAPSCorps has been their answer to fighting this lack of data. 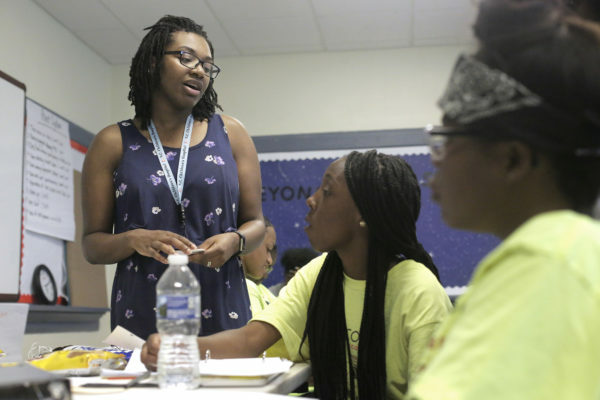 What started in 2009 as coverage of six communities in the south side of Chicago has evolved into students mapping two-thirds of the city. The program has also expanded to include New York City and Niagara Falls. Their site in Rocky Mount, in both Nash and Edgecombe counties, is the first rural community covered in the program. 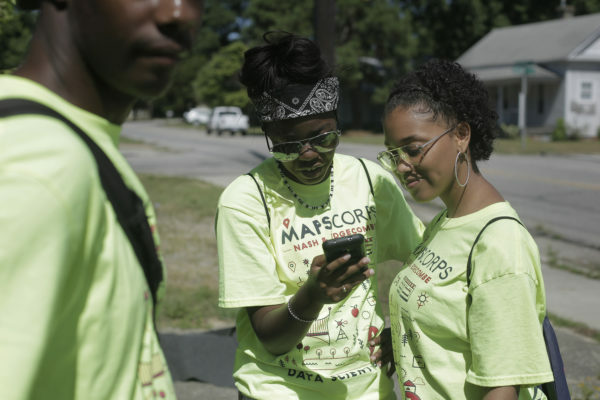 Giselle Corbie-Smith, director of the UNC Center of Health Equity Research, had already been conducting research in the northeastern part of the state, and saw MAPSCorps as a perfect fit. Both the center and the project work with communities to emphasize the resources they have, not what they’re lacking, she says, and their methods rely on the community’s help in conducting research. Jasmine Atkinson and Tyler Carter enter business information into a MAPSCorps phone app. The program depends on organizations in Rocky Mount to give feedback on the most appropriate ways to conduct research in their community, and how to improve the dissemination of findings to the public. “It’s a resource-intensive project and many critical people in the community put in a lot to make this work,” says Leah Frerichs, co-investigator and faculty mentor. This is the third summer high school students from Rocky Mount have worked on the MAPSCorps project. After a morning of mapping, they regroup for the positive youth development program ­– focusing on personal and professional development to build on leadership, communication, and team-building skills. This time is also dedicated to the students developing their own research projects, which they present in a public symposium at the end of the summer. “They conduct a social science research project that pertains to an issue or challenge that’s going on in their community and they tie it into the data they collect,” Robinson-Ezekwe explains. Nicole Robinson-Ezekwe gives O’Tasia Brinkley advice on her research project about crime near convenience stores. Students have been investigating a variety of community issues like obesity, criminal activity, and barriers to public transportation. Frerichs says the goal of this work is two-fold. “We want them to see the importance of data, of science, of research, and that they can learn about these different opportunities for their own career development,” she explains. MAPSCorps Nash and Edgecombe would like to give a special thanks to the University of Chicago, MAPSCorps, Project Momentum Inc., the Youth Connect program at Opportunities Industrialization Center Inc., National Heart, Lung, and Blood Institute, Community Engagement Organization, Project GRACE, Little Bethlehem Apostolic Faith Church Inc., New Beginnings Christian Center, South Side Health & Vitality Studies, and Resourceful Communities. Stacy Tessler Lindau is the founder of MAPSCorps, president of the board of MAPSCorps, director of the South Side Health & Vitality Studies, and professor of obstetrics, gynecology, and medicine-geriatrics at the University of Chicago. Giselle Corbie-Smith is principal investigator of MAPSCorps Nash and Edgecombe, director of the UNC Center for Health Equity Research and professor of medicine and social medicine in the Department of Social Medicine within the UNC School of Medicine. Nicole Robinson-Ezekwe is project coordinator of MAPSCorps Nash and Edgecombe, and research specialist for the UNC Center for Health Equity Research within the UNC School of Medicine. Leah Frerichs is the faculty mentor and co-investigator of MAPSCorps Nash and Edgecombe, faculty associate with the UNC Center for Health Equity Research in the UNC School of Medicine, and assistant professor in the Department of Health Policy and Management at the Gillings School of Global Public Health. This entry was posted in Health, Society, Video. Bookmark the permalink.